An eccentric little church lost in the fields near to some woods, half a mile from the village not far from the Suffolk border. A quarter mile track runs up beside a field to reach it. The restoration here was very quirky, under the eye of the vicar. His wife set all sorts of ecclesiological junk in the outer walls, I've seen nothing quite like it before. On my first visit a year or so ago I could not find the keyholder's house for love nor money. However, on my way to this church for a second visit I popped into the nearby friendly little church of Little Yeldham first. I was pottering about when a very pleasant elderly gentleman came in. It turned out he was the church warden. I told him about my plan to see inside Tilbury church, and he entered into the spirit of the occasion. He rang up the Tilbury churchwarden for me, to arrange the church to be open - but the churchwarden was going out. 'Don't worry, I know where there's another key!' he told me. He was really enjoying himself. 'I'll go and get it, and meet you at the church!' And so he did. He drove, I cycled and got there not far behind him. Tilbury church is delightful inside. The interior has more reset junk, and 15th Century wallpaintings, some of which she over-painted in her own inimtable naive style. She had also added some of her own for good measure. There is, fortunately for us all, nothing quite like it, but to see naive folk art on this scale in a remote setting was fascinating. The over-paintings are awful of course, but rather wonderful all the same. And if I hadn't stopped at Little Yeldham I would never have seen them. 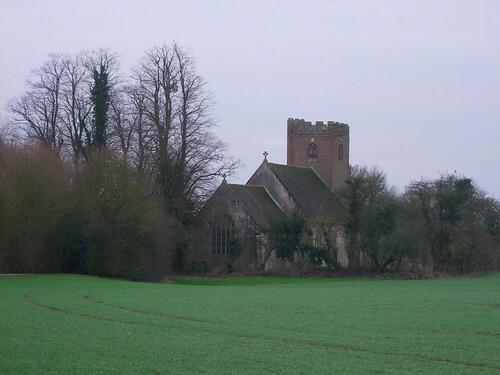 I said my grateful thanks to the helpful churchwarden, and headed on through Great Yeldham to Stambourne.